We have some exciting news to share with you! As you may know, Walmart has recently updated from its Version 2 to Version 3 (V3). Over the last few months, our development team has been working hard to implement the necessary changes. We’re happy to announce that Zentail’s integration with Walmart V3 is now ready! What's new in Walmart V3? Walmart V3 aims to simplify the process of creating new listings and to help sellers drive more sales. Implementation of Key Features – allows you to highlight 3 to 10 important and informative benefits of your item that will motivate customers to purchase the product. Be sure to put the most important features first and to include key words in your key features! Refined Product Types - Walmart has updated a lot of the category names to make them more specific. Our team has re-optimized our SmartTypes and assigned Walmart categories we believe will generate the most sales for the seller. Product groups – Variant Attributes must be selected from Walmart’s list of valid values based on the category. New accounts will automatically be opted in for Walmart V3, but older accounts will need to manually opt in. Walmart recommends switching to V3 as they plan to phase out V2 within the next 6 months to one year; therefore, Zentail suggests you update to V3 by October 2017 as we will also focus our support and development on V3 going forward. To verify if your account is using V2 (legacy) or the new V3, please go to the Walmart tab on your Integrations page. 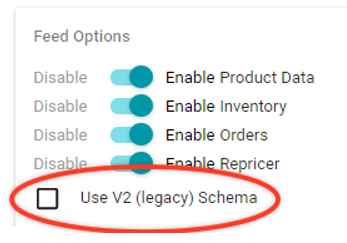 In order to switch to V3, make sure the “Use V2 (legacy) Schema” box below the Feed Options is unchecked and click Save Settings.